A strong year of pedigree Limousin sales closed with a record breaking trade at the Red Ladies Derby and Weaned Calf Show and Sale held at Borderway Mart, Carlisle on Friday 8th December 2017. Very much leading the way was the Grahams herd of Robert and Jean Graham, Airthrey Kerse Dairy Farm, Bridge of Allan, Stirling. Smashing the record for a Limousin Weaned Calf the Grahams herd sold the January 2017 born Grahams Natalie to a sale topping price of 38,000gns and eclipsing the old mark of 10,500gns set in 2016. The record breaking price followed on from earlier in the day when the June 2016 born Grahams Malibu lifted the Red Ladies Sale pre-show Supreme Championship before selling for the top price in that sale of 25,000gns. On a memorable day’s trading the Grahams herd sold five animals in all, across the two sales, to gross a fantastic £102,900. In the bull section of the Weaned Calf sale, Grahams Nashville, made 20,000gns when being bought by PM & L Harris & Son Ltd for their Saltbrook pedigree herd at Alkmonton Old Hall Farm, Alkmonton, Ashbourne, Derbyshire. January 2017 born, Grahams Nashville is another embryo calf and the same way bred as the day’s top price. This calf arrived at Carlisle having recently won the Junior Male Championship and Reserve Junior Championship at the prestigious Stars of the Future Calf Show held in Stirling. The Saltbrook herd also purchased the stylish Aultside Mystique for 18,000gns from Garry Patterson, Upper Forgie, Aultmore, Keith. This maiden heifer had placed first in class six of the Red Ladies Derby Show. An embryo calf, and August 2016 born, she is by Wilodge Cerberus and out of the Hargill Blaze daughter Spittalton Flush. Mystique is a full sister to the 55,000gns Aultside Hulk who was sold at Carlisle in May 2014. Another from the Weaned Heifer Calf Sale, Glenrock Northernstar from SD Illingworth, Howgillside, Eaglesfield, Lockerbie, made 15,000gns. A March 2017 born heifer, Northernstar had plenty of breeding behind her being by Haltcliffe Doctor and out of Glenrock Fantastic who is a past Reserve Supreme Champion at the Royal Highland and Great Yorkshire Shows and is out of the herd matriarch Glenrock Spangle. Purchasing this heifer was W Corrie for his Drumhilla pedigree herd at Drumhilla Farm, Newtownards, Co. Down, Northern Ireland. Making 12,000gns, and also from the Weaned Heifer Calf Sale, was the May 2017 born Swalesmoor Nessa from Kedzlie Farms Ltd, Kedzlie Farm, Blainsie, Lauderdale. This embryo calf is by the 35,000gns Foxhillfarm Jasper and is out of the 125,000gns world record breaking maiden heifer Glenrock Illusion. This calf was bought by Gary Bell, t/a Haas Side Farm, Lockerbie, for his burgeoning Haassidefarm pedigree herd. Standing second in her class to the Red Ladies Supreme Champion was the much admired Millbrow Misty from George & Pat Long, Mill Brow, Ambleside, Cumbria. A June 2016 born Wilodge Vantastic daughter, this heifer is out of Millbrow Tricia described as one of the best breeding females of the Millbrow herd. Heading to its new home in Wales, this heifer sold for 11,000gns and was bought by SW Jones for his Perth pedigree herd at Pencefn, Pentir, Bangor, Gwynedd. The final animal to breach the five figure mark was another from Robert and Jean Graham and in the shape of Grahams Marjorie. 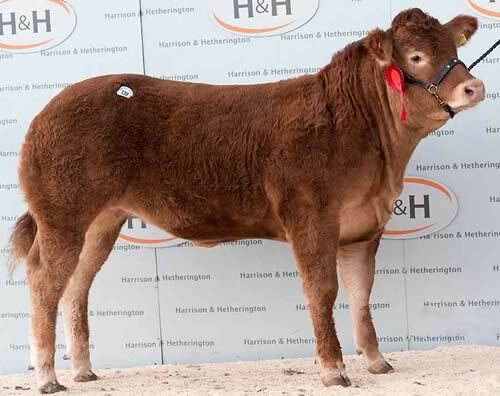 This September 2016 born heifer had stood first in Class Seven of the Red Ladies Show and was purchased for 10,000gns by R & A White & Son, Two Thorns Fields Farm, Snake Road, Bamford, Hope Valley for their Ladybowers herd. Grahams Marjorie, an embryo calf, is by Ampertaine Foreman and is the first female to be offered for sale out of the Wilodge Flawless daughter Poolehall Isabella. A number of animals on the day sold to breeders in the Republic of Ireland. Included in these was the first prize winner from Class Five of the Red Ladies Show, Melbreak Mambo from first time consignors K&S Williamson, Benburb, Co Tyrone. Originally bred by Mr & Mrs J Callion, Dromore, Co Tyrone, this July 2016 heifer is by the AI sire Lodge Hamlet and is out of the Nenuphar daughter Melbreak Jive. Purchasing Melbreak Mambo at 8500gns was Damian Maher, Camblin, Roscrea, Co. Tipperary. The weaned heifer calf Dinmore Nefertiti from Paul Dawes, Dinmore Manor, Hereford, made 8000gns when selling to AK & JK Smith, 4 South Park, Jacobstow, Bude, Cornwall. An embryo calf, Nefertiti is a full sister to the world record priced bull Trueman Jagger being by Ampertaine Gigolo and out of Trueman Grazia. Another to go to the Republic of Ireland was the 7000gns weaned heifer calf Foxhillfarm Naughtybutnice from Mr & Mrs M Alford, Foxhill Farm, Cullompton, Devon. Naughtybutnice is by the French sire Neuf and is out of the show winning Foxhillfarm Izzy a daughter of the prolific Bankdale Alice. This January 2017 born heifer was snapped up by John McInerney for his Drummin herd at Clonmoney West, Newmarket on Fergus, Co. Clare. Following on from their earlier trade in the Red Ladies Sale, George and Pat Long sold their January 2017 born weaned heifer calf Millbrow Naomi for 6500gns. This January 2017 heifer is another by Wilodge Vantastic and is out of the Sympa daughter Millbrow Faith. Taking this animal home was Esmor Evans for his Esmors herd at Monfa, Gwornaffield Road, Mold, Flintshire.